Berezhnaya was born in the southern Russian town of Nevinnomyssk, her mother having moved from Voronezh and her father from beyond the Urals. She has an elder brother, Alexei, and a younger one, Ivan. Her parents divorced when she was five due to her father's alcoholism; her mother remarried but eventually divorced again. The family also included a cousin, Nadezhda, whose parents had died. Berezhnaya began skating at the age of four in Nevinnomyssk. At the age of 8, she began to be coached by Nina Ruchkina, who had arrived from Moscow. When Berezhnaya was 13, her coach asked her to switch from singles to pairs. Ruchkina had decided that her son, Alexander Ruchkin, should be a pair skater despite not being physically suited for the discipline – and she wanted Berezhnaya, as the smallest girl, to be his partner. Although Berezhnaya enjoyed watching pair skating, she was skeptical of the proposed partnership but Ruchkina convinced her mother that the pair would get a chance at CSKA Moscow's skating school. The coaches at CSKA also had doubts about Ruchkin's suitability but accepted the pair. Berezhnaya moved to Moscow, 791 miles to the north, and lived in a dormitory as her mother could not move with her. They made little progress as Ruchkin continued to struggle to lift her. After unsuccessful partnerships with Ruchkin and another skater, the 14-year-old Berezhnaya teamed with Latvian-born Oleg Shliakhov, who had been dumped by his seventh partner. The partnership went well at first, however, over time he started to become physically and verbally abusive, hitting Berezhnaya and dropping her from lifts. He decided to move to Riga, Latvia, saying they would have better and cheaper training conditions. Seeing no alternative partner, she went with him. Although not violent outside the rink, he became abusive again in training. Berezhnaya kept quiet and did not tell her mother, worrying it would worsen her poor health. She continued for her mother's sake, "I knew that she would watch me skate on TV and that it gave her strength. She was the only reason for me to continue." They trained on their own for a year as no coach wanted to take the pair but eventually found a coach unaware of Shliakhov's reputation. They had a strong showing at the 1994 Winter Olympics in Lillehammer, Norway, finishing eighth. The next season they won a pair of silver medals at the 1994 Skate Canada International and 1994 Trophée de France and finished 7th at the 1995 World Championships. Having little success in keeping Shliakhov in line, their coach resigned at the end of the season. The Latvian federation appealed to renowned coach Tamara Moskvina to take on the pair and she eventually invited them to train with her in May or June 1995. They spent a few months training in Colorado Springs, Colorado and then trained mostly at Yubileyny Sports Palace in Saint Petersburg, Russia, despite the deteriorating and crowded facilities of the 1990s. [a] Berezhnaya/Shliakhov won bronze at Skate America, gold at Trophée de France and bronze at Nations Cup. Shliakhov was well behaved for half a year, but then dropped her from a lift. Moskvina had professional psychologists work with him regularly, however, after brief periods of calm with apologies and professions of affection, he would start to slip back to his old behavior. Berezhnaya thought he showed some improvement, however, Moskvina told her it was not enough and advised her to end the partnership. Shliakhov was registered at a mental hospital in Riga. Berezhnaya had begun to develop friendships with the other skaters at Yubileyny, becoming particularly close to Anton Sikharulidze, the 1994 and 1995 World Junior champion with Maria Petrova. Shliakhov began to perceive Sikharulidze as his rival. At the end of 1995, Shliakhov demanded that they train in Riga for three weeks in preparation for the 1996 European Championships. Sikharulidze urged her to stay in Saint Petersburg but she believed she could manage a few weeks. On 9 January 1996, Berezhnaya was seriously injured when Shliakhov's blade sliced into her skull while the pair were practicing a side-by-side camel spin in Riga. Two surgical operations were performed to remove bone fragments from her brain. The accident caused partial paralysis on her right side, and doctors were unsure if she would walk again. She also briefly lost the ability to speak. During her hospitalization, Sikharulidze heard of the news, and traveled to Latvia to be with her, joining Moskvina. Berezhnaya was surprised and overjoyed to see him, but unable to speak or move. Shliakhov also arrived at the hospital with flowers but Berezhnaya did not wish to see him again. Her mother, Sikharulidze, and Moskvina took her back to Saint Petersburg, Russia where she could begin her rehabilitation. She was grateful for his support, saying she was "skinny, shaved, half-alive, almost a skeleton, and Anton so tenderly cared about me. Perhaps it was his belief in me that helped me recover so quickly." Berezhnaya wished to return to the ice and doctors agreed that physical exercise would be therapeutic. 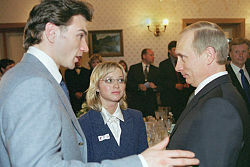 On 15 March 1996, only two months after the accident, she began skating carefully with Sikharulidze's help and Moskvina observing. Berezhnaya said, "I didn't have any false dreams about the future. All I thought about was those first steps." Moskvina felt the pair looked promising, "They're a natural pair. They've got it – something magical." With Berezhnaya's condition improving, the two began to consider the possibility of a competitive career together. She had made a nearly full recovery, although her speech remained slurred requiring speech therapy. As of 2010, only a minor speech problem remained. She returned to competition in November 1996, skating with Sikharulidze at Trophée Lalique where the pair won bronze. In December, they placed fifth at Cup of Russia, and then captured the silver medal at the Russian Nationals, earning them a berth to the European Championships. In January 1997 in Paris, Berezhnaya/Sikharulidze made the podium at their first Europeans together, obtaining the bronze medal. At the 1997 World Championships in March, their short program placed them provisionally in third, with two judges giving them first-place votes. However, the pair placed 12th in the long program and dropped to 9th overall. The next season, Berezhnaya/Sikharulidze won the European Championship, defeating 1992 Olympic champion Artur Dmitriev with his new partner Oksana Kazakova, and the reigning World Champions Mandy Wötzel/Ingo Steuer. At only 20 and 21 years of age respectively, Berezhnaya/Sikharulidze had established themselves as gold-medal favorites going into the 1998 Winter Olympics in Nagano, Japan. Observers were impressed by their rapid progress. Ekaterina Gordeeva selected the pair as her and Sergei Grinkov's skating doubles in a documentary on the legendary team after her husband's death. At the Olympics, the pair had one fall in the short program but their other elements were of high quality. In the long, they put themselves back in contention for the gold medal with a strong performance, until five seconds from the end when they had a surprising fall as Sikharulidze set her down from a closing star lift. Although disappointed by suddenly giving away their chance at the gold so close to the end of the program, Sikharulidze recovered from his shock and joked, "It's a new finish. If you don't like it, we'll change it, no problem." The quality of the rest of their skating earned them the silver medal ahead of Wötzel/Steuer, while Kazakova/Dmitriev claimed the title. Former Japanese singles skater Yuko Kawaguchi became inspired to switch to pair skating after seeing Elena Berezhnaya at the Nagano Olympics. Following the Olympics, Berezhnaya/Sikharulidze competed at the 1998 World Championships where they won the gold medal. Later in the year, they spent some time training at the Stamford Twin Rinks in Stamford, Connecticut. They won 1998 Skate America and 1998 NHK Trophy. In January 1999, they had to withdraw from the European Championships after the short program due to Berezhnaya having the flu. They won their second world title at the 1999 World Championships in March 1999. The Yubileyny Sports Palace ice rink then closed for renovations, forcing the pair and Moskvina to relocate to Hackensack, New Jersey's Ice House in the summer of 1999. Berezhnaya/Sikharulidze struggled at Skate America in October 1999, placing third, but regained their form to win Skate Canada in November. Moskvina would later admit Sikharulidze had become distracted by life in a new country and was not as focused on training. In February 2000, the pair won gold at the 2000 Europeans but were stripped of their medals after Berezhnaya tested positive for pseudoephedrine, a substance whose ban was lifted temporarily between 2004 and 2010 before being banned again. This resulted in a three-month disqualification from the date of the test, and the medal being stripped. She stated that she had taken cold medication approved by a doctor but had failed to inform the ISU as required. The pair missed the World Championships that year as a result of the disqualification. Berezhnaya/Sikharulidze developed a rivalry with Canadians Jamie Salé and David Pelletier. The 2001 World Championships were held in Salé/Pelletier's home country of Canada. Although Salé fell on the triple toe loop in the short program and then singled her double Axel in the long, Salé/Pelletier were awarded gold ahead of Berezhnaya/Sikharulidze. In autumn 2001, Sikharulidze required stitches for a 12 cm (4.7 in) long gash along his arm when his partner's blade accidentally cut him in training just before the start of the Grand Prix season. The injury having delayed their preparations, Berezhnaya/Sikharulidze used their Charlie Chaplin program at the start of the season and debuted their new long program to Meditation de Thais at the Grand Prix Final in December. The pair decided to keep their new programs for the Olympics, while their rivals abandoned their new long program, with which they had been struggling, and decided to reuse their old Love Story program. The New York Times speculated that the judging might be influenced by the crowd response, with the familiar music of Love Story having more potential to draw louder applause in North America and the judges not being immune to human reactions. At the 2002 Winter Olympics in Salt Lake City, both pairs skated strong short programs, after which Berezhnaya/Sikharulidze were in first and Salé/Pelletier, who had a fall at the end of their program, second. In the long program, Berezhnaya/Sikharulidze skated a good program although Sikharulidze had a stumble on a jump element before quickly regaining unison with his partner. Salé/Pelletier, meanwhile, had no obvious mistakes. Four judges placed the Canadians first, while five had Berezhnaya/Sikharulidze as the winners, with the Canadians receiving higher technical scores and the Russians higher presentation scores. They were awarded the gold and the Canadians the silver. The result sparked a controversy with the media emphasizing Sikharulidze's stepout, although there was no media criticism a year earlier when Salé/Pelletier were awarded gold at the 2001 World Championships. The International Skating Union's Technical Committee decided to look into the matter, first approaching French judge Marie-Reine Le Gougne, the only Western judge in favor of the Russian pair. She allegedly said that she had been intimidated by the head of the French skating organization into voting for the Russian pair in exchange for an advantage for the French couple in the ice dancing competition, which was to follow a few days later. A second gold medal was awarded to the Canadian pair, and the IOC and ISU decided to declare both pairs as Olympic co-champions. 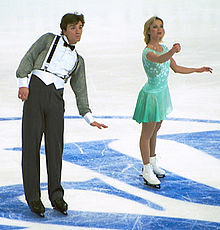 In May 2003, Berezhnaya/Sikharulidze confirmed they had retired from competitive skating. From 2002–2006, they toured with Stars on Ice, then returned to Russia. Although taking time off to have two children, Berezhnaya made occasional appearances in Russian ice productions. In 2006, Berezhnaya teamed with the actor Aleksandr Nosik for the Channel One (Russia) ice show Stars on Ice (Russian: Звёзды на льду). In 2008, she was paired with the pop star Dima Bilan for the Russia 1 series Star Ice (Звёздный лёд). In 2009, she skated with the comedian Mikhail Galustian in the Channel One series Ice Age 3 (Russian: Ледниковый период-3). She also skated with former training mate John Zimmerman in the Kings on Ice (Короли льда) show in 2009, and with Jérôme Blanchard in Ice Heart (Ледяное сердце). In 2010, she joined another edition of Ice Age, teaming up with Igor Ugolnikov. Berezhnaya/Sikharulidze skated together at a City Lights-themed ice show in Moscow from 14–17 October 2010. In late 2010 and early 2011, Berezhnaya played the White Queen in an Alice in Wonderland ice show in St. Petersburg and Moscow, alongside Alexei Yagudin and Tatiana Totmianina/Maxim Marinin. In autumn 2011, Berezhnaya participated in the third season of the Canadian reality program Battle of the Blades, partnered with former NHL player Curtis Leschyshyn. In November 2011, she announced her retirement from performing. Berezhnaya coaches at the Yubileyny rink in Saint Petersburg. Sikharulidze and Berezhnaya had an on-and-off romantic relationship between 1996 and 2002; they remain close friends. With former husband Steven Cousins, Berezhnaya has a son Tristan – born 6 October 2007 in London, England – and daughter, Sofia Diana (diminutive: Sonia) – born on 21 June 2009 in Saint Petersburg, Russia. In August 2010, the children were baptized in an Orthodox church in Saint Petersburg, with Sikharulidze becoming her son's godfather. and not having informed the ISU as required. three months of competition from the date of the test. ^ a b Nikitin, Ilia (28 January 2010). Время для красивой сказки (in Russian). peoples.ru. Archived from the original on 23 December 2011. ^ a b c d e f g h i j k l m n o p q r s t u Елена Бережная. Мой лед: история ненависти и любви. Russian magazine: Коллекция каравана историй, No. 5(15), pg.90–102. (in Russian). narod.ru. October–November 2008. Archived from the original on 23 December 2011. Retrieved 13 September 2010. ^ a b c d Fomina, Inna (22 August 2002). Елена Бережная и Антон Сихарулидзе: ледовый роман [Elena Berezhnaya and Anton Sikharulidze: Ice novel]. Городской дилижанс (in Russian). Magic Pair. Archived from the original on 13 December 2011. ^ a b Mittan, J. Barry (1997). "Bereznaia and Sikharulidze". jbmittan.com. Archived from the original on 12 May 2008. ^ a b Елена Бережная, олимпийская чемпионка Солт-Лейк-Сити (in Russian). km.ru. 20 August 2002. Archived from the original on 23 December 2011. ^ a b "1998 Winter Olympics – CBS profile". Archived from the original on 18 October 2005. ^ 1995 International Team Challenge, U.S. broadcast of Berezhnaya and Shliakhov free skate. ^ Flade, Tatyana (July–August 1994). "Olympic Stars Skating On Thin Ice At Yubileiny Palace". St. Petersburg Press. Archived from the original on 29 April 1999. ^ Katz, Rachel (March 1995). "Local stars attack lack of facilities". St. Petersburg Press. Archived from the original on 29 April 1999. ^ a b c "Berezhnaya documentary with Shliakhov interview". Archived from the original on 13 July 2011. ^ Yazeva, Elena (25 November 2009). Я тренировал психически больного человека! (in Russian). mk-piter.ru. Archived from the original on 22 July 2011. ^ a b c d e f Dam, Julie K.L. (9 February 1998). "The Miracle on Ice". Time. Archived from the original on 9 September 2005. ^ a b c d e f g Longman, Jere (19 March 1997). "Russian's Comeback In Pairs Is Stunning". The New York Times. ^ a b c Frey, Jennifer (10 February 1998). "An Accidental Pairing, a Perfect Couple". Washington Post. Archived from the original on 23 December 2011. ^ a b c Fomina, Inna (20 October 2010). "Я слышала дочкино "ноу" и плакала" [I heard my daughter crying] (in Russian). 7dn.ru. Retrieved 10 November 2010. ^ "1996 Trophée Lalique, Paris, France · November 15–17, 1996". Archived from the original on 18 October 2004. ^ "1997 European Championships, Paris, France · January 20–26, 1997". Archived from the original on 18 October 2004. ^ Glauber, Bill (7 February 1998). "Skater's spirit is Olympic-sized Berezhnaya favored for gold 2 years after near-fatal accident". Baltimore Sun. Archived from the original on 23 December 2011. ^ Glauber, Bill (19 March 1997). "Winning isn't first for Berezhnaya After near-fatal injury, comeback draws ovations". Baltimore Sun. Archived from the original on 23 December 2011. ^ a b Shipley, Amy (10 February 1998). "Russians Win a Pair of Medals in Pairs". Washington Post. Archived from the original on 23 December 2011. ^ Fyodorov, Gennady (20 October 2009). "Kawaguchi braves taunts to skate for Russia". Reuters. Archived from the original on 25 January 2010. Retrieved 26 October 2009. ^ Longman, Jere (2 April 1998). "A World Title Crowns Berezhnaya's Comeback". The New York Times. ^ Mariani, Dominic (1 November 1998). "Russian Champions on the Stamford Ice". The New York Times. ^ "1999 World Championships – ABC profile". Archived from the original on 16 November 2005. ^ a b c "Elena BEREZHNAYA/Anton SIKHARULIDZE: 2001/2002". International Skating Union. Archived from the original on 2 June 2002. ^ a b Wallechinsky, David (2009). Complete Book of the Winter Olympics. Retrieved 9 July 2010. ^ a b "2000 World Championships – Pairs". Ice Skating International. Archived from the original on 14 November 2011. Retrieved 6 June 2010. ^ Roberts, Selena (11 February 2002). "Canadians Take Aim At Russians' Long Streak". The New York Times. ^ "Berezhnaya-Sikharulidze impress the judges". Associated Press. 9 February 2002. ^ Harvey, Randy (13 February 2002). "Skating on Thin Ice? It Figures". Los Angeles Times. ^ Dixon, Robyn (16 February 2002). "It's an Outrage to Russians". Los Angeles Times. ^ Jackson, Jon. On Edge. p. 197. ISBN 1-56025-804-7. ^ Бережная и Сихарулидзе завершают выступления в любительском спорте (in Russian). newsru.com. 26 May 2003. Archived from the original on 23 December 2011. ^ Алиса в стране чудес на льду (in Russian). 6 August 2010. Retrieved 23 August 2010. ^ "Berezhnaya ends her career". CBC News. ^ Сыграем свадьбу, когда родим второго (in Russian). mk.ru. 22 April 2008. Archived from the original on 23 December 2011. ^ "Road ban for drink-driving Olympic skater". Blackpool Gazette. 10 August 2013. ^ Бережная родила сына фигуристу, с которым познакомилась на Олимпиаде (in Russian). newsru.com. 9 October 2007. Archived from the original on 23 December 2011. ^ Елена Бережная: "Моя дочь будет принцессой" [My daughter will be a princess] (in Russian). Moskovsky Komsomolets. 27 June 2009. Archived from the original on 23 December 2011. ^ Звездные крестины – Антон Сихарулидзе стал крестным отцом сына Елены Бережной [Anton Sikharulidze became godfather of Elena Berezhnaya's son] (in Russian). Tvoy den'. 24 August 2010. Archived from the original on 23 December 2011. ^ "Short programs". A Pair of Hearts. Archived from the original on 16 May 2008. ^ "Long programs". A Pair of Hearts. Archived from the original on 9 May 2008. ^ "Exhibition routines". A Pair of Hearts. Archived from the original on 30 December 2007. ^ "Elena BEREZHNAYA/Anton SIKHARULIDZE: 2001/2002". International Skating Union. Archived from the original on 11 November 2001. ^ "Elena BEREZHNAYA/Anton SIKHARULIDZE: 2000/2001". International Skating Union. Archived from the original on 19 April 2001. Wikimedia Commons has media related to Elena Berezhnaya. This page was last edited on 15 December 2018, at 04:31 (UTC).